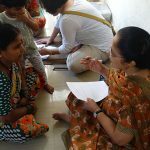 Gyaan Ruchi aims to reach out to women from economically weaker sections of society, on the periphery of educational opportunities, and help them to transform their lives through literature and the arts. We believe that the creative process will enable them to become more aware of their own potential as well as about the world of opportunities around them. Literature and the arts are dynamic tools that can help women to improve their political and social participation, and to believe in their own capabilities. We are developing a well-planned comprehensive programme which will help women to raise questions, initiate and evolve an interest in reading and writing and engage in dialogue, thus building their confidence through self-expression and interaction. Ideally we aim at encouraging women through literature to ultimately reach a point in their own awareness and growth whereby they choose to empower themselves through functional literacy. Creativity being enhanced under the module. 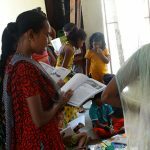 We do not believe in reinventing the wheel but instead seek to collaborate in various capacities with other NGO’s working in the realm of women’s literacy and empowerment. 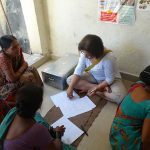 Gyaan Ruchi’s resource initiative at Gyaan Adab Centre will collect, document and catalogue valuable resource materials available and being developed as well as conduct training and orientation programmes led by experienced professionals. Our present project areas are located in Yerwada, Shashtri Nagar, Sagar Colony, Jai Bhavani Nagar, Kishkinda Nagar (Kothrud), Ishratwadi (Kondhwa), Mula Road, Taufkhana, Tupe Nagar (Hadapsar), Mangalwar Peth and Tadiwala road in the city of Pune. As Gyaan Ruchi is Gyaan Adab’s main mandate, a concerted effort is made to gather community support and raise funds through the numerous cultural programs and events held at the centre.